Lexus LF-A supercar | What Car? Behold the Lexus LF-A, a supercar that remains a concept car despite being launched in 2005 and contesting this year's Nurburgring 24-Hour race in front of 100,000 fans. Powered by a mid-mounted 500bhp 5.0-litre V10 engine, the car has a top speed of 200mph. It oozes high-performance styling, too, with much of its body made from aluminium and carbonfibre to save weight. Even the two radiators to cool the engine are rear-mounted to aid weight distribution. They feed air through ducts just above the rear wheelarches onto a rear spoiler, which is activated at high speed to create more downforce and increase grip. So will it ever make production? 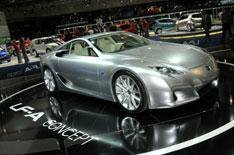 Almost certainly - Lexus has invested a lot of time and money in developing the car to such a high level. The question of when remains, though. Frustratingly, Lexus won't commit to a date. Lexus will show its high-performance IS-F at the show. The car is powered by a 417bhp 5.0-litre V8, which takes it from 0-62mph in 4.8 seconds. It also features an eight-speed semi-automatic gearbox, high-performance brakes and 19-inch alloy wheels. It's also lower and lighter than the IS compact executive on which it is based, and features styling changes that include a deeper front spoiler, wider wheelarches and side vents. Lexus is also using the show as an opportunity to show off its range of hybrid vehicles. On display will be the RX 400h 4x4, GS 450h sports saloon and LS 600h executive car.